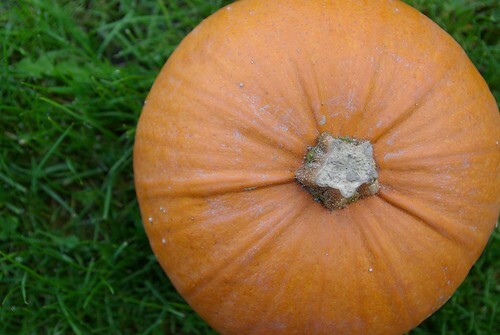 Here’s the main ingredient in tonight’s dinner – a cute little pumpkin from Blue Heron Farm. This year we’re doing something a bit different than our usual soup – stay tuned and I’ll let you know how it turns out. Happy Hallowe’en, Samhain, and Dia de los Muertos to all! Ummm… it is Halloween. That explains why everyone is dressed up as flappers and circa Austin Powers hippies at the co-op. I can remember when everyone dressed up as hippies, daily. thought I was someplace else for the moment and am very glad I’m not. forgot… I had one of your homemade caramels. yum. washed it down with the 205 Petite Syrah and then it became very difficult not to eat the rest.